Sprint is an Italian cycling magazine specialized in photos of riders. 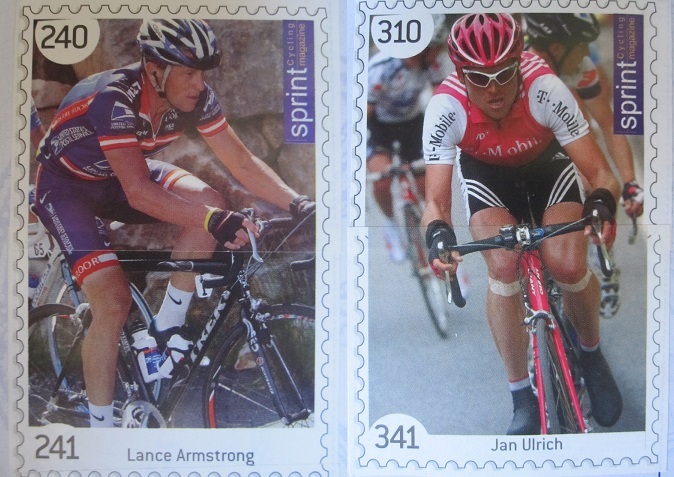 For the season 2004 they released a sticker album that includes the main teams and riders of the professional circuit. New stickers were included every month with the magazine to cover all the stickers of the collection. It is a large collection that includes 39 teams and a total of 588 stickers. It focuses especially on Italian teams that have a larger number of stickers. The complete overview with teams and stickers is reported in the summary at the end of this post. For each team there are stickers of the jerseys, the managers, and riders. For some of the main teams displaced over two pages there is also an additional photo (composed by two stickers) of the top rider in action. The last page of the album is a section dedicated to the Italian riders abroad (Italiani all'Estero) that did not find space in their team page or they belonged to teams not included in this collection. Among them Trentin, Bramati, Sciandri and Guerini.